*Mild-Spoiler Warning – I won’t mention specific plot threads (i.e. Luke Skywalker is revealed as Chewbacca’s Great Aunt Petunia), but I will talk about the narrative, so stay away if you wish to remain unsullied. Star Wars is back!! And it’s as Star Wars as Star Wars can possibly be. Forget everything you saw in the prequels (JJ Abrams and the good people at Disney did), and focus on the swashbuckling, fun sci-fi/fantasy you remember from that first time you saw Star Wars (later to be titled A New Hope). 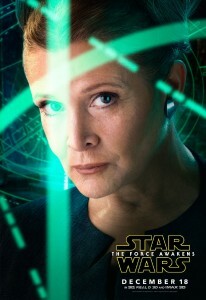 The Force Awakens serves as a jumping off point for a new saga of heroes, villains and zany sidekicks who are independent from the old guard in the original trilogy. At the same time, it is a reactionary piece of art that does everything possible to regain the trust of the audience, demonstrating that the new era of Star Wars films is made by fans, for fans. The characters, universe, lore and memories you once had are treated with respect. The Internet hates the Prequels because “they ruined their childhood” (well…the Internet hates everything), but those same childhoods are meticulously rebuilt and expanded within this entry. That isn’t to say this film is only for fans, though that is clearly the target audience. Newcomers are walked through the conflict, mysteries of the galaxy and shown why they should care through the next generation of characters. Daisy Ridley (Rey) and John Boyega (Finn) are charismatic, relatable and instantly bond with the audience. These are the heroes you are looking for. Rounding out the trio is Oscar Isaac (Poe) whose role on screen was brief but impactful—look for much more of him in future installments. Rey/Finn/Poe are the next generation Luke/Han/Leia in their familiarity, banter and camaraderie – but they aren’t cookie cutter versions of those that came before them. Traces of each archetype are found in the new heroes, with a mixture of their own personality traits. Star Wars isn’t just loved for its heroes; it’s also enjoyed because of strong villains (don’t believe me…check out all the Darth Vader merchandise on your apples, water, cookies and other household wares). Adam Driver (Kylo Ren) is a complicated character with an intricate past – with which the film wisely cues the audience in during the second act instead of forcing a twist. Ren manages to be a formidable opponent but not a clone of Vader; in fact, he is purposely designed to not be the stoic imposing force Darth was. The new class could stand on their own and the film would still be considered good, but what pushes it into the realm of greatness for fans is the treatment of the original heroes, especially Han. 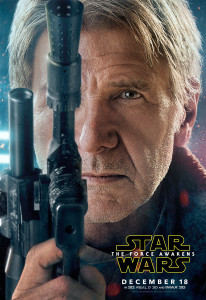 Harrison Ford is Han Solo with every gesture, quip and moment of the film. 30+ years of activity has swirled around the galaxy, but Han and Chewie remain true to themselves and are exactly what fans were hoping for. One of the main goals in Episode II was too see how many CGI flips Yoda could do in a single moment…it was a spectacle. There are no moments in The Force Awakens like this…praise the maker. Instead, practical effects are used where possible and computer graphics are used wisely to flesh out the universe and enhance the storytelling. The move is absolutely gorgeous, but not overshadowed by its own shiny green screen backgrounds. There is the perfect amount of backstory to keep the plot moving without being weighed down by questions of why the galaxy is different than after the celebration on the forest moon of Endor. The audience is told everything necessary to enjoy this adventure and fans who need to know a catalog of events which led to this moment can sate their curiosity through the expanded universe. The Force Awakens is a surprisingly funny film. BB8, Finn, Rey, Han, Chewie and even the Storm Troopers will break up the drama with a quick aside or jab. The humor is self-referential but never so obtuse that only people who remembered the model number of Luke’s X-wing will understand what is happening. If you’ve read everything to this point you might have noticed lots of comparisons to the original trilogy. That is because Force Awakens is a remixed version of these films. Characters within The Force Awakens have direct counterparts to people we have seen before: BB8, Supreme Leader Snoke, Captain Phasma, Chewbacca—these are the newer versions of R2-D2, The Emperor, Bobba Fett…and Chewbacca. Even the old heroes are recast as analogous characters to the original trilogy. It goes beyond just the character archetypes, as the plot is extremely familiar – just with the bigger stakes and a stronger intensity than before. The story is safe, maybe to its detriment. At one point I remember thinking while watching, didn’t we see Obi Wan in this exact situation before? 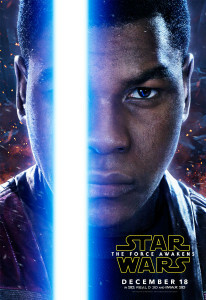 If you ever loved Star Wars in your life, or even just kinda liked it, then you owe it to yourself to see this film. If you hated Star Wars forever…this probably won’t change your opinion, but if you have someone in your life you who likes the films you owe it to them to sit through and pretend you had a good time. Episode VII is the best Star Wars film ever created (search your feelings, you know it to be true); it just doesn’t have 40 years of nostalgia to bolster its prestige. It isn’t the technical leap forward that Episode IV was in 1977 but it is exactly what fans wanted and needed to be excited for the next 40 years of adventures. 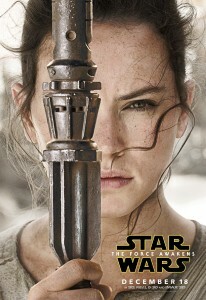 Thank you Disney, thank you JJ Abrams and even thank you Lucas for making this all possible. May the Force be with You, Friends!